This 12-day package combines the major WW2 campaigns, in NW Europe; Battle of Normandy, Battle of the Scheldt, Battle of the Rhine and the Liberation of Holland This complete package will especially appeal to those who have an in-depth interest of the entire Canadian campaign of NW Europe and especially for those who had a relative that served in the campaign. 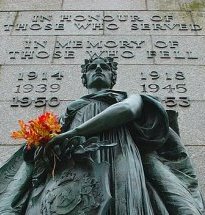 The Maple Leaf Tour follows the same route that our Canadian heroes took, from Juno beach in Normandy until the end of hostilities on VE Day, May 8, 1945, in Holland. This tour starts in Bayeux, Normandy and ends in Deventer, Holland. Day 4 – You will drive today from Bayeux to Maldegem, Belgium to prepare for the Battle of the Scheldt tour. Overnight in Maldegem. Day 5,& 6 – You will visit the Canadian War Cemetery. We then have a look at the events at the Leopold Canal and Moerkerke and work our way north to the heart of the Scheldt battles. You will explore the actions of Operation Switchback, Operation Infatuate & Vitality, Operation Suitcase and the terrible events at Woensdrecht. Overnight in Bergen-op-Zoom. Day 7 – We continue our tour of the Scheldt and tour the Breskens Pocket, Woensdrecht, (where the Canadian Black Watch experienced their worst day of the war, on ‘Black Friday’ – October 13, 1944) Hoogerheide, the Causeway, Walcheren Island, Westkapelle. Day 8 – You will drive today from Bergen-op-Zoom to Deventer, with free time in preparation for the Battle of the Rhine. Day 9 & 10 – Begin your Battle of the Rhine tour where you will visit the Canadian war cemetery at Groesbeek; then into Germany where we stop at the largest Commonwealth Cemetery in Germany in the Reichswald Forest. We will visit Kleve, Wyler, Den Heuvel, Louisendorf, the Goch-Kalkar road, Mooshof, Xanten, the Hochwald Gap, Rees, Bienen, Speldrop, Emmerich, Hoch Elten. We cover all areas of Operation Veritable, Operation Blockbuster, and Operation Plunder (Turnscrew). Please see detailed descriptions of these Operations on our Battle of the Rhine page. Day 11 & 12 – We now turn to the Liberation of Holland to conclude your tour experience. Here, you will tour the route that our Canadian Liberators took in April 1945. You will visit Doetinchem, Arnhem, Nijmegen, Zutphen, Apeldoorn, Lochem, Almen, Villa Rozenhof, (where Capt. Geo. Blackburn earned his MC), Deventer and the tour ends with a solemn visit to one of the most beautiful of all Canadian War cemeteries, in Holten, where 1,394 Canadian heroes now rest. Overnight in Deventer. Your once-in-a-lifetime tour has now ended. Many thanks for touring with Canadian Battlefield Tours. This tour starts in Bayeux, Normandy (France) and ends in Deventer, Holland. It is your responsibility to get to Bayeux to begin the tour and to make your own arrangements for travel when the tour ends in Deventer. Our Maple Leaf Route Tour condenses your time, resulting in savings on lodging and meals. We are able to condense the time for you by reducing travel times. You will still visit all the sites covered in the individual tour options, but the transition between the tours will be seamless and contiguous. As with our other tour options, this tour will be a private, personalized tour, available anytime on a first come-first serve basis, ideally for groups of 1-3 people. If you have any special requests, like following the footsteps of a particular Veteran or unit, we are happy to accommodate, whenever possible. If you do have an interest in a particular soldier or unit, please provide us with his details and we will do some preliminary research, to make your tour an even more meaningful experience. Of course, the tours combined in this package are still available on a standalone basis or any combination thereof, that best suits your interests. This tour, as well as our others, will be priced on the following basis. The price quoted will be for all ground transportation within the battlefield areas, with professional guide(s). It does not include anything else. Of course, we are happy to make recommendations to help with your travel planning, like hotels, B&B’s. There are many hotel booking sites but we have always liked http://booking.com.